It was an unprecedented seismic event that came without warning. He'd never experienced tremors like this. But it was happening, there was no denying that. He pulled the box from his back pocket. His hand was trembling. If there were a Richter scale for nervousness, he would have been off the charts. This was his first gift. The first gift is always the hardest. Would she love it or hate it? All his doubts disappeared when she opened the box and found the Stauer Cascade Helenite & Blue Topaz Earrings. Helenite is the gift you give when you really need to shake things up. Following the sudden and amazing display of nature's power that was the 1980 eruption of Mount St. Helens, something unexpected and beautiful was discovered. A brilliant green creation was produced from the heated volcanic rock dust. Named "helenite" after the mountain from which it was born, its vivid color and amazing story captured the attention of jewelry designers worldwide. And this ring puts that electric-green stone on full display. 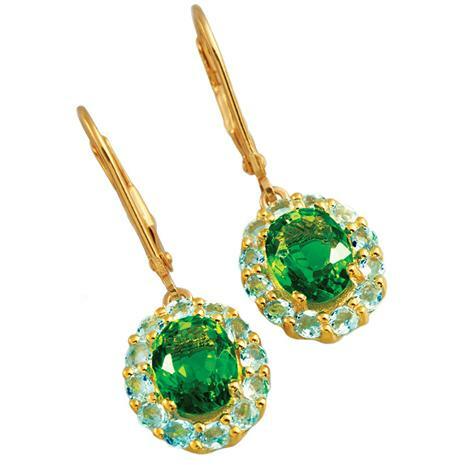 The Cascade Helenite & Blue Topaz Earrings absolutely erupts with explosive green. At the center we've placed a massive faceted helenite oval - it seems to almost glow internally, as if lit by some verdant fire. Set in the finest .925 sterling silver and finished in luxurious gold, the stone flashes and flickers in radiant glory, echoing its dramatic origins. And to balance the bright heat of that gorgeous green we've surrounded the impressive stone with the soothing cool hue of blue topaz rounds. We transformed one of history's most impressive displays of raw power into a romantic and refined expression of love.